So far Tim Thomas has created 57 blog entries. Letters to Hestia, a full circle performance of death and rebirth, is a play that includes poetry, song, dance, and ritual. We are scheduling Salons for this coming season in Austin and Dallas. Remember that to have a Salon in Austin, you must have attended two Salons. Austin Salons are the last Sunday of every month, DFW Salons are flexible, but generally occur on Monday nights. Email christi@scriptworks.org, if you want to sign up. THE WORST PLAY I NEVER WROTE with Paul Bonin-Rodriguez part of Nouveau 47's Nouveau Frontiers New Works Festival Saturday, May 21st from 2-4pm Nouveau 47 at the Magnolia Lounge in Fair Park (map) Admission is $10 at the door! Bring paper and pen. This workshop comes to creative development from the least likely direction - that of prospective failure - for the purposes of freeing up our creative voices and illustrating just how capable we already are at rescuing bad writing, especially after a first reading, during which everyone has fidgeted awkardly. Working separately, but caucusing together, we'll find ways to rescue bad plots, stilted dialogue, corny jokes, and overly long descriptions (as in the first sentence). Two dimensional characters will expand; melodramas will find their hidden Brecht; unnecessary adverbs will get pruned out; and we'll all be the wiser. Really. Finally, because the workshop leader bragged about it in his bio, we'll discuss where we might take our new plays for continued chrysalis-like development. 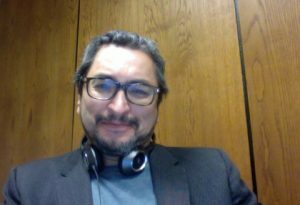 ScriptWorks presents a Dramatis Personae Workshop with Octavio Solis Tuesday, May 3rd 7 - 9:30pm Dougherty Arts Center 1110 Barton Springs Rd. (map) $20 ScriptWorks members/$25 general Reserve your seat by emailing info-at-scriptworks.org This class with award-winning playwright Octavio Solis will involve relaxation and visualization exercises as part of the writing process. Participants will do their writing in the class and then read what they wrote aloud.